Please fill out the following form and then hit the Submit button. A Med-Van representative will contact you with your requested information. If you prefer, you may call 1-888-633-9995 or print out this form and fax it to (814)-948-6184. Will Any of the Following Be Needed? 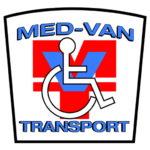 Med-Van Transport is proud to provide quality professional transportation services to residents, nursing homes, hospitals, rehabilitation centers, and dialysis clinics throughout our region. Our professional, caring staff is what sets Med-Van apart from other services. We pride ourselves on having satisfied customers who will recommend Med-Van to their friends and family. © 2018 Med-Van. All Rights Reserved.